Heat oven to 400°F. Spray 13x9-inch baking dish with cooking spray. Poke each sweet potato several times with fork. Place on microwavable plate. Microwave uncovered on High 5 minutes. Cool 5 minutes. Using serrated knife, cut sweet potatoes crosswise into 1/8-inch slices, leaving bottom 1/4 to 1/2 inch intact. Place sweet potatoes in baking dish. Brush potatoes with 1 tablespoon of the melted butter. Sprinkle with salt. Bake 50 to 65 minutes or until completely tender. Brush with remaining tablespoon melted butter. Brush sweet potatoes with maple syrup. Top with bacon and thyme. 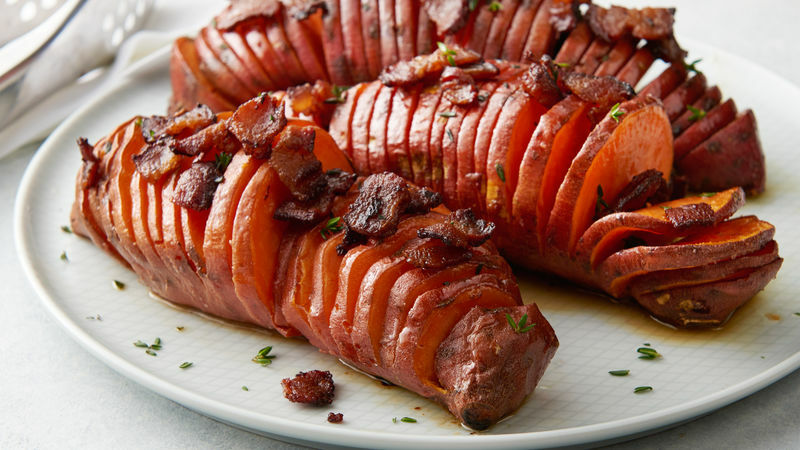 To cut sweet potatoes Hasselback-style, place a wooden spoon lengthwise against sweet potato. Hold one side of sweet potato and use a long, serrated knife to make thin cuts in one half of the potato, leaving bottom 1/4 to 1/2 inch intact. Turn; make thin cuts in other side. The spoon’s handle will stop the knife and help prevent slicing through the entire sweet potato. If your sweet potatoes are very thick, microwave an additional 2 minutes.